La Liga (Spain's top-flight football league) leaders Barcelona defeated minnows Girona 2-0 to register a commendable eighth straight victory. La Liga (Spain’s top-flight football league) leaders Barcelona defeated minnows Girona 2-0 to register a commendable eighth straight victory. 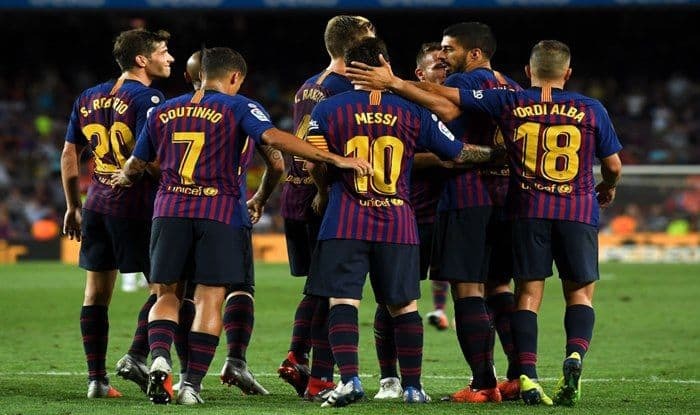 The game on Sunday featured the three top scorers of the 2018/19 La Liga season: Barcelona’s Argentine star, Lionel Messi, who obtained his 19th goal, and Uruguay’s Luis Suarez (15) as well as Girona’s Uruguayan forward Cristhian Stuani, reports Efe news. However, it was Portuguese defender Nelson Semedo who opened the scoring nine minutes into the game taking advantage of a loose ball inside the area and the video assistant referee confirmed the goal. This was Semedo’s first goal since joining the Catalan club in 2017 from Benfica for a reported $42.24 million. Barcelona, who dominated the game from start to finish, could have scored the second goal at the quarter-hour mark, but Brazilian midfielder Philippe Coutinho was unable to get past goalkeeper Yassine Bounou in a one-on-one situation set up by Messi. Once more, Messi proved to be a headache for any defence he faces, teaming up with Spanish left-back Jordi Alba and threatening Girona’s goal on several occasions, including firing a shot that nearly got past Bounou in the 22nd minute. As the minutes ticked away, Girona grew in confidence and even had an opportunity to draw level in the 41st minute, when Barcelona defender Gerard Pique cleared defensive midfielder Pere Pons’ effort off the goal line. After the intermission, Barcelona continued to put Girona under pressure, but it was the visitors who nearly scored in the early going of the second half, although German goalkeeper Marc-Andre ter Stegen blocked Stuani’s shot. A few minutes later, Girona had a setback as Colombian central defender Bernardo Espinosa was sent off after being booked twice. Despite the numerical disadvantage, Girona’s efforts continued in search for the equalizer but without posing any real danger to Barcelona’s goal. Seven minutes after the one-hour mark, Messi scored the second goal on a nicely executed shot as he was set up for a one-on-one situation against Bounou by Alba. After conceding the second goal, Girona seemed to be throwing in the towel and Barcelona had several scoring chances, but Bounou prevented Messi and Croatian midfielder Ivan Rakitic from scoring as the 2-0 lead remained in place until the end of the game. After the win, Barcelona remains atop the La Liga table with 49 points while Girona temporarily fell to the 14th spot with 24 points.